Step 1: Tungsten atoms evaporate from the hot filament and move toward the cooler wall of the bulb. Step 2: Tungsten, oxygen and halogen atoms combine at the bulb-wall to form tungsten oxyhalide molecules. Step 3: The bulb-wall temperature keeps the tungsten oxyhalide molecules in a vapor. 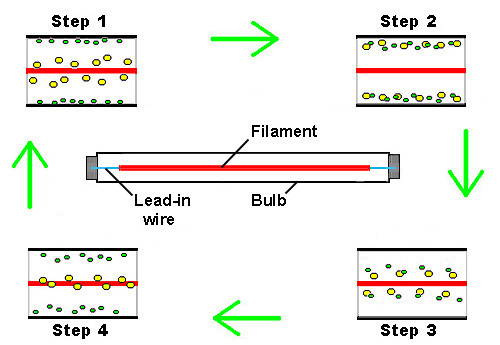 The molecules move toward the hot filament where the higher temperature breaks them apart. Step 4: Tungsten atoms are re-deposited on the cooler regions of the filamentnot in the exact places from which they evaporated. Breaks usually occur near the connections between the tungsten filament and its molybdenum lead-in wires where the temperature drops sharply. For more information about tungsten halogen lamps see Webnote 7-1.